Indigo Pony is a design studio where we create handmade jewelry. Every single piece is made with love in our tiny Bedstuy studio. Our minimalist and structural pieces are made with locally sourced materials including, mixed metals, semi-precious stones, and vintage findings. 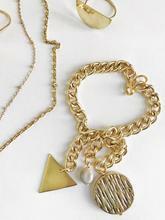 Our jewelry is inspiring, purposeful, and fun, and we are so glad you chose us to play a part in how you choose to confidently show up in the world every day. Indigo Pony is the brainchild and passion of Sheena McCullers. She's been making jewelry since 2016 but has always loved remixing and creating her own fashion and style. Why did you create Indigo Pony? I wear all of the designs myself. I was led to create a business after multiple women stopped me in the streets of NYC to ask "Where did you get those earrings? "After stylish and dope women kept asking me about my jewelry, I knew is was time to create my own business and Indigo Pony was born! This all conveniently happened after I took metalsmithing classes at Liloveve Studio and interned for some of the best boss babe jewelry businesses in NYC- BaubleBar & Brooklyn Charm, just to name a couple. My main mission is to provide stylish and affordable jewelry to strong, independent women that want to slay everyday with amazing accessories. Thank you for shopping and thank you for being an Indigo Pony woman. What inspired the Spring Collection? Back in December I took a trip to Johannesburg and Capetown and it was life changing! I was particularly inspired by how locals use every day materials to make something out of nothing. I witnessed vendors making trendy sandals out of rubber tire pieces, kitchen utensils out of wood, jewelry out of plants, and bowls out of beads & electrical wire. It taught me two things 1. creativity and sustainability go hand in hand 2. it’s OK to enjoy the simplicity of shapes, patterns, textures, and materials we see in our everyday journeys. What is your favorite piece from the line? 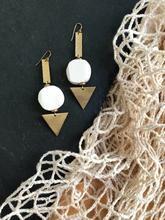 I love every piece from this line, but right now I am particularly digging the Township Triangle Earrings. They have a strikingly beautiful white bone bead that really compliments the brass components! The best business advice I’ve ever received is to not be too prideful to pay other people to do a job you’re not qualified to do for your business. It saves a lot of time (and sometimes embarrassment) in the long run!